The Sentinel PRO system from Sensaphone provides site operators 24/7 remote monitoring, data acquisition and real-time visibility of all their remediation sites from a user-friendly cloud-based dashboard. The Sentinel PRO system seamlessly integrates to a Modbus-enabled PLC, SCADA or control panel. Supporting both Modbus RS-485 and TCP protocols, the Sentinel PRO can take advantage of the controller's existing configuration and read sensor values, flow totals, run times and pulse counts directly without adding additional sensors. Operators can view these values in real-time from their phone via the free iPhone/Android app or website. The easy-to-use dashboard allows users to set alarms, acknowledge alerts and generate reports. The Sentinel PRO system notifies users immediately of possible problems with equipment such as soil vapor extraction (SVE), groundwater treatment, leachate and landfill gas systems. The Sentinel PRO is also used to monitor VOC detectors, air sparge compressors, vacuum blowers, air strippers and generators. The Sentinel PRO system is also a data acquisition device that makes it fast and easy to data log information like blower runtimes, pilot and flare temperatures, liquid or air flow totals, VOC levels and shutdown and startup events. The system can generate reports for the state or locality overseeing the remediation site and supports the MASSDEP alarm notification format. Only one Sentinel PRO unit is required to monitor up to 64 Modbus registers and 12 different digital or analog status conditions. 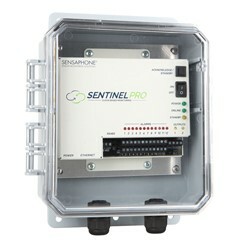 The Sentinel PRO system is Ethernet-based, but it is also available with a cellular option for remote locations where internet connectivity is unavailable. Click here (https://www.sensaphone.com/industries/environmental-remediation/product/sentinel-pro.php) to learn more about the Sentinel PRO monitoring system for environmental remediation sites. Sensaphone offers a comprehensive line of remote monitoring products that safeguard valuable assets by tracking critical environmental data such as temperature, humidity and power failures. Sensaphone products provide alerts and proactive monitoring data to homeowners and facility managers in many areas including telecommunications, oil and gas, water and wastewater, HVACR, agriculture, healthcare, data centers and greenhouses. More than 400,000 Sensaphone systems are in use today around the world, and they continue to be manufactured in the USA. For more information, ,visit www.sensaphone.com.